The French press is a very popular option for brewing coffee. The French press consists of a cylindrical carafe and a mesh filter. The coffee brews in the water rather than the water flowing through the grounds. The grounds stay under the filter and the strained coffee goes above the filter. Coffee made in a French press is meant to be consumed as soon as it is brewed. Because of that, you can expect a fresh and delicious cup of coffee when you use a French press. You can also expect a rich, hearty flavor with this brewing method. You can make your coffee even better by choosing one of the best coffees for the French press. Turkish coffee is a great option if you have a French press. Turkish style coffee are made in several places in the world, including the Middle East, North American, and Eastern Europe. This type of coffee is full of flavor and is usually strong. This plays to the strength of the French press. 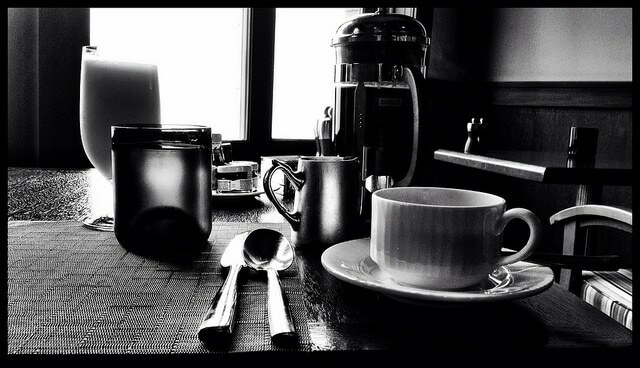 The French press preserves both the flavor and strength, leaving people with an amazing cup of coffee. If you go this route, Turkish Blend French Roast is a wonderful option. This blend is darker and stronger than expresso, making it perfect for people who enjoy a dark roast. The French press brings out the flavors of the dark roast. While this is a very dark roast, it does not have a bitter flavor. Because of that, it is even popular with people who do not normally enjoy a dark roast. Not everyone has an iron stomach to drink both orange juice and coffee at breakfast, but it sure makes for a cool photo. Enjoy a cuppa with breakfast! Indonesian coffee is another excellent option with the French press. Consider a Sumatran Dark Roast. This Indonesian coffee is rich and full-bodied, giving it a robust taste that you will not find with many other blends. While it has deep tones, it is also gentle, making it easy to enjoy cup after cup. Best of all, this blend creates a balance by providing the darker tones that come with a darker roast while still offering the nuances of a lighter roast. This really comes out when coffee drinkers use a French press. In addition, this blend is not packed full of caffeine so you do not have to worry about getting the jitters when you drink it. You also won’t have to worry about staying up all night if you have a cup in the evening. Ethiopian coffees are known for their multitude of flavors. The French press does a great job of bringing those flavors out. The Yirgacheffe is a great example of a coffee that goes well with the French press. This coffee is grown in the Sidamo province of Ethiopia and has a unique flavor that coffee aficionados enjoy. It is accented with citrus and spice flavors. It has a sweet aftertaste that resembles milk chocolate. The coffee is smooth going down and has a floral aroma that can fill the home. You can get it in a dark or medium roast, depending on what type of roast you like. Both work well with the French press so it is really a matter of preference. You can try them both to see which one you like more. This is a pretty common means of preparing a French press, but we highly recommend a burr grinder and not a blade grinder (shown) because you can get much more consistency on the grind and the grounds are not heated by the blade. 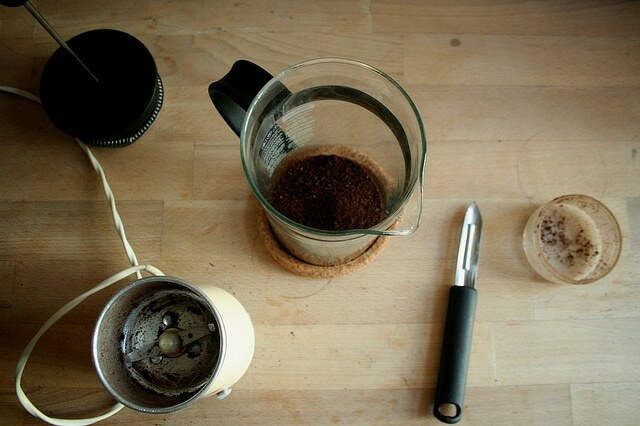 A good home burr grinder generally costs between $75 and $150. The French press is an excellent way to make fresh coffee. Choose beans that have been roasted from between three days to a month prior, in order to get the best results. Grind coarsely. Then, brew your favorite coffee and enjoy it, sip by sip. Pay special attention to the way the flavors explode when you drink coffee from a French press. As you get used to the different flavors, experiment with different roast levels to see which one you like best.